A fish finder is used to locate fish in the water (as the name suggests) when on a boat. They use SONAR technology to locate fish in the water and are a great tool to improve your fishing results. They use a digital screen to show the location of the fish as well as change any settings. Some fish finders are very sophisticated and can run up to hundreds of dollars or more, but today we’re going to list the best good inexpensive fish finders for kayaks. The Lucky Portable Fish Finder is the cheapest fish finder on our list at around $40.00, but is still packed full of features. The LCD screen shows the location of fish including the depth of the water, short and tall weeds as well as the terrain. The screen works in all weather and can be viewed in both the sunlight and is backlit for the night time. The device comes with five different settings and you are able to adjust the sensitivity of the sonar and turn on the backlight. The detecting rate is up to 100 meters with a 45 detecting degree. The device uses four AAA batteries which last around 4-5 hours before having to replace them, which can be increased by using the battery saving mode. The Garmin Stiker 4 is currently one of the most popular fish finders on the market and while slightly more expensive than the Lucky, it is well worth the investment. The scanner is very detailed and the high frequency sonar gives a very clear visual of the terrain under your kayak. The device is simple to use with tactile buttons and is available in 3.5 inch, 5 inch or 7 inch displays. The CHIRP (77/200 kHz) sonar transducer; transmit power (200 W RMS)/(1,600 W peak-to-peak) and is effective to up to 1600 feet in freshwater or up to 450 feet in saltwater. User reviews are all very positive, and the Garmin is one of the best value for money fish finders currently available. An upgrade from the baseline Lucky fishfinder, the light model retails for around $99.00. The increase in price gives a good increase in features though. The display is more detailed and has a depth capability of 147 feet. The beam is upgraded to a 90-degree cone and the device is both waterproof and floats. The Battery has also been upgraded and can be recharged with a 10 hour use time off one charge. If you need the extra features and battery time, we recommend checking out this device. The ZacX Sonar Fish Finder is an app based device which connects to your phone rather than having a built-in screen. The device works with both Apple and Android phones and connects via Bluetooth. All standard features are included to give you a great detailed view of the water which is easy to analyse for both beginners and advanced users. The sonar can scan down to 157 feet, and has a fish light included to help attract fish. The Phiradar FF688C is one of the higher range devices on our list, but is still very affordable at around $150.00 at the time of writing. It is ideal for both amateurs and professional fishermen and can be used on all fishing conditions from freshwater to saltwater. The display is 3.5 inches and can be read in both high sunlight and low vision. This depth reading reaches up to 984 feet or 300 meters with a 200KHz/83KHz duel beam sonar frequency. There is also a multi-lingual option for those that would prefer a device that is not just in English. The Garmin Striker is so good we included it twice. This device has all the benefits of the standard device but also includes a portable kit. This is ideal for transporting the device and its parts and is also great for ice fishing. For the garden or the yard a rotary clothes line is a great choice for drying your clothes outdoors. Taking up less space than a standard washing line, rotary clothes lines are easier to move depending on where the best drying area is and can be folded away easily to save even more space. This is our favorite all-round dryer. It is in the middle price range for a rotary dryer and has everything you need. It comes in two sizes, 164ft and 196ft drying space depending on the size of our garden or yard but does this very efficiently so it won’t take up too much room. There are three different levels of elevation you can choose from and the hight can also be adjusted from 50 to 74 inches. All arms have custom holes in that you can add clothes hangers to and dry delicates, and are large enough to accommodate large items like bed sheets and duvets. For storage there is a closable concrete spike as well as a cover for then the drying is not in use. Household Essentials have a range of rotary clothes lines, with their parallel dryer being our favorite. It has a unique flat top design, unlike the usual ‘umbrella’ opening mechanism which makes hanging your washing simple as all the line is even and easy to reach. The line is made out of rust-proof steel and fits into a ground sleeve that is provided meaning that the line has maximum stability when installed. The clothesline comes ready to go and all you need to do is set it up, pop out the top and you’re ready to go. The Strata line of rotary washing lines is a very popular one, and their lines come in 91′, 164′, 184′ and 194′ meaning that there is a size for everyone. The Stata line is particularly heavy duty and most users comment on the good build quality. The price is also reasonable starting at around $45 for the smallest model and going up to a competitive $91.99 at the time of publishing. The Sunshine 100ft Clothesline is one of the biggest on our list, and is able to hold up to 3-4 wash loads of clothes and can handle kingsized sheets easily. User reviews of this line praise its build quality and stability. The line is installed ina ground socket and can be removed to allow you to mow around the garden where you have it installed. Due to its size and build quality it is one of the more expensive rotary lines on the market but it is well worth the cost. The final rotary clothesline on our list is the Drynatural Foldable Umbrella. This is on the cheaper end of the lines on our list and is perfect for anyone that needs a line they want to be able to move around rather than be limited to one place. The line has a good amount of hanging space at 65ft and is strong enough to handle large towels and bedding straight out of the wash. This is a great line at just over $50, and it comes with pegs, a carry bag and metal stakes to secure it to the ground. The BaoFeng UV-5R gets our top spot as the best and one of the most affordable ham radios available right now. 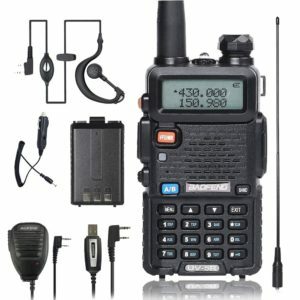 For less than $40 you get the radio, an additional 1800mAh UV5R battery, a car charger, 1 hand mic and antenna. This set-up you will never run out of battery, as one can be charging as the other is in use. In addition, the antenna included will give you more than enough range, and the display screen makes the device simple to use. Also included is the programming cable, which allows for easy connection to your PC with the software included in the bundle. Most reports state that battery life is at least several days, and often beats out more technical and expensive units. This is by far the best ham radio for beginners and a cheap way to get everything you need. You can buy as a single unit or in packs of 6 and 10. The ICOM 2300H 144Mhz is a very solid 2-way radio. The unit has a stable 65W of output, and is an updated version of the popular ic-2200. 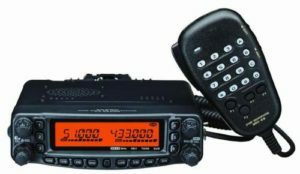 This is a very solid HAM radio and can take a lot of punishment if necessary, and has been tested to the most recent mil-std-810 g specs for durability. You get 207 alpha-numeric memory channels and get a CD with the software you need to get everything set up. There is also a 3 inch LCD screen with multiple scan functions. 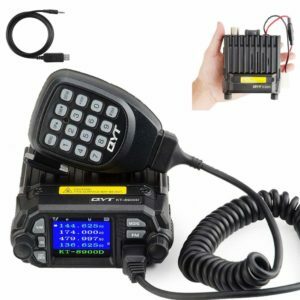 The QYT KT-8900D is a very compact HAM radio, with a frequency of HF 136-174MHz, UHF 400-480MHz and a power output of VHF 25Watt, UHF 20Watt. The speaker and transceiver are both very compact which is ideal for saving space. This doesn’t take away from the performance though, with a clear and loud sound coming from the speaker and 200 programable channels. The display is bright and easy to see even with glare. The unit comes with a programming cable and software (supported by CHRIP or MIKLOR) which is compatible with Windows 10. The radio also comes with a 6ft cable and connects to your cigarette plug port. The Yaesu Ft-8900R transmits 50 watts on 10, 6 and 2M, & 35 watts on 440 MHz and has selectable lower output settings. There is a backlit keypad on the mic for using the radio at night, 800 channels available on the memory and live dual displays, giving the Yaesu some of the best specs on the market. The radio also includes a YSK-8900 separation kit. The radio is easy to install and configuring the radio via ADMS software is simple. When up and running the volume is loud on all channels and when coupled with an antenna the quality was great on all bands. This is an ideal choice for anyone looking at the upper end of the HAM radio market without breaking the bank.